George Armstrong was one of the numerous Toronto Maple Leaf players who competed with the Toronto Marlboros of the OHA prior to the start of his NHL career. The town of Skead, Ontario sits on the shores of Lake Wanapitei about 25 kilometres northeast of Sudbury. Northern Ontario has always supplied a healthy percentage of players to the National Hockey League, but no time was more productive than the late-1940's through the 1950's for players emerging from cities like Sudbury, Kirkland Lake and Timmins. And George Armstrong is just one of many players who burst out of that fertile hockey hotbed and made a significant name for himself in the NHL. Born July 6, 1930, George Armstrong spent most of his childhood in Falconbridge. His father worked in the area's nickel mines while George learned his hockey skills on the local rinks. A big boy, Armstrong dominated early, and by the age of 16, was starring with the Copper Cliff Redmen of the Northern Ontario Hockey Association, along with future Maple Leafs' teammate, Tim Horton. During the 1946-47 season, George scored 6 goals and 5 assists in 9 games, enough to draw the attention of NHL scouts. 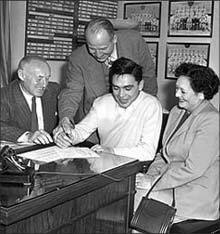 A youthful George Armstrong signs a contract with the Toronto Maple Leafs to the delight of both Conn Smythe (left) and Armstrong's mother (right). The Toronto Maple Leafs put the young forward's name on their negotiation list, and in 1947-48, George moved south to Stratford, where he joined the junior Kroehlers. Adjusting to his surroundings off the ice was cumbersome at first for the 17-year-old, but he proved his comfort on the ice, where he led the league in scoring, collecting 73 points. By the next season, the Maple Leafs wasted no time in assigning George to the Toronto Marlboros' roster. In two seasons with the Marlies, Armstrong made his presence more than known. In 1948-49, he earned 62 points and was called up to the senior Marlies for their playoff run. 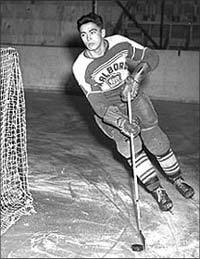 But by 1949-50, Armstrong exploded for a league-best 64 goals (an OHL record at that time) along with 115 points, and was again added to the senior Marlies for their Allan Cup run, this time successful, partly attributed to George's contribution of 19 goals and 19 assists for 38 points in 14 games. Syl Apps (in suit) gives his number 10 to George Armstrong as Captain Ted Kennedy and other teammates look on. Earlier that season, George made his debut with the Toronto Maple Leafs. On December 3 and 24, 1949, the teenaged forward stepped onto the ice at Maple Leaf Gardens with the reigning Stanley Cup champions, and although held scoreless, did not look out of place, and gave Toronto fans a brief glimpse into the future. While playing with Pittsburgh in the American Hockey League, George was summoned to the Leafs again in 1951-52, and during that stint, scored his first NHL goal, described in the Toronto Daily Star like this: 'His goal was a lulu. 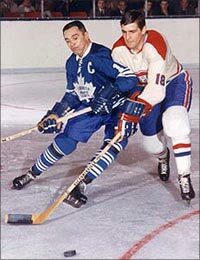 He took Bentley's pass in full flight, brushing big Butch Bouchard aside as he stormed around him, then fired a low one that McNeil got his skate on but couldn't handle. Big George jumped two feet in the air, let go a war-whoop that was drowned in the tremendous cheer that greeted the rookie's goal.' That goal was also the game-winner. George Armstrong embraces the Stanley Cup in 1962 for the first time in his career. Armstrong joined the Leafs full-time in 1952-53, despite suffering a shoulder separation in training camp that year. King Clancy, assistant manager, stated, "This kid's got everything. He has size, speed, and he can shoot 'em into the net better that any hockey player I've known in a long time. I'll be surprised if he doesn't become a superstar." Over the seasons to follow, George proved to be an exceptionally strong positional player, not adverse to going into the corners and able to supply the Maple Leafs with consistent seasons of 15 to 20 goals. But more importantly, he proved to be an outstanding leader  well-loved by his teammates and highly respected by management. Conn Smythe, owner and manager of the Leafs, named Armstrong his captain prior to the 1957-58 season, and later claimed that he was "the best captain, as a captain, the Leafs ever had." After a decade of futility, the Toronto Maple Leafs' franchise began to take a turn for the better as the 1960's approached. Several young players, who would turn out to be the foundation of a dynasty, arrived from the junior affiliates, the Toronto Marlboros and the St. Michael's Majors, including Carl Brewer, Bob Baun, Bob Pulford, Dave Keon, Frank Mahovlich and Billy Harris. And to guide them, George Armstrong's role became that much more important. In 1959, he was awarded the J.P. Bickell Award for his contributions to the Maple Leafs. George Armstrong (10) and the Toronto Maple Leafs celebrate their 1967 Stanley Cup victory over the Montreal Canadiens. 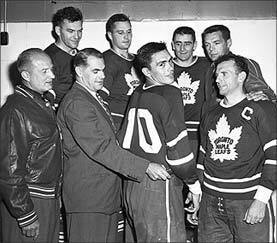 The Maple Leafs won the Stanley Cup in 1962, tearing it from the grip of the defending champions, the Chicago Black Hawks. At centre ice following a deciding 2-1 win on April 22, 1962, NHL president Clarence Campbell summoned Armstrong to accept the Stanley Cup on behalf of his teammates. It was a sweet moment of satisfaction for George, who had endured 10 seasons without coming anywhere close to sipping champagne from Lord Stanley's mug. The Leafs repeated in 1963, then again in 1964. Detroit was the challenger in the Stanley Cup final both years. 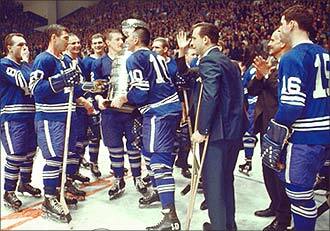 Then, in 1967, with a team considered too old to stand a chance, the Leafs triumphed again. 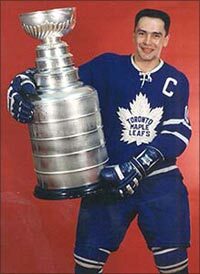 36-year-old George Armstrong, the longest serving captain in Toronto Maple Leafs' history, accepted the Stanley Cup on behalf of his teammates for the fourth and final time in his storied career. Following the 1969-70 season, a campaign in which he suffered a second knee injury that curtailed his play, Armstrong retired. He was convinced to return for one final season, although the captaincy had passed to David Keon by that point. George struggled through the 1970-71 season and then retired permanently at the age of 40. His final game was April 4, 1971, the penultimate game of that regular season. George concluded his career having played 1,187 regular season games, scoring 296 goals, assisting on 417 others for a cumulative point total of 713. At the time of his retirement, Armstrong had played more seasons, and more games in a Leaf sweater than any other player, and was second in career points. In post-season play, George participated in 110 contests, scoring 26 times, earning 34 assists and 60 points. At the time of his retirement, his playoff games placed him first as a Leaf, second in goals and first in points. Even more than the points he contributed, Armstrong's leadership is what set him above his peers. Following his retirement as a player, George was hired by the Maple Leafs as coach of the Toronto Marlboros, leading the junior squad to Memorial Cup championships in his first season (1973) as well as in 1975. In 1978, George left the Marlies for a scouting position with the Quebec Nordiques, but returned to Toronto nine years later as assistant general manager and scout. In his first season back, after the firing of John Brophy, Armstrong found himself thrust into the role of interim coach for the final 47 games of the season, an uncomfortable role for the former captain. He returned to his scouting position the next season, and remains with the Leafs as a scout. In 1975, George Armstrong achieved the highest honour afforded a professional hockey player when he was recognized by being inducted into the Hockey Hall of Fame. He was given the highest honour bestowed upon a Maple Leaf when in 1997-98, his jersey #10 was honoured by the team, with his banner hanging from the rafters.